Memberships begin at $50.00 for individuals, $50.00 for groups and organizations, and $250.00 for corporations. Friends (or members) of the Guadalupe River Park Conservancy receive a monthly e-newsletter full of interesting and timely information on the development of the River Park & Gardens; opportunities to attend lectures and workshops; discounts at local nurseries and florists; and invitations to special events and openings. Most importantly, individual and corporate members know they are contributing, through their financial support, to the development of a new recreational resource for our community. Here’s what your donations allow us to do. Matching Gift — Let us know if you work for a company that has a matching gift program and you’d be willing to submit a request. If you aren’t sure, you can write a comment…we might know. You can also leave this field blank…it is not required. 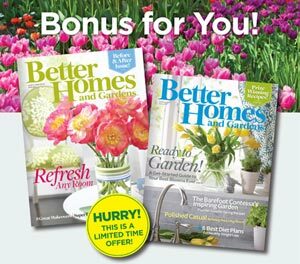 Become a member today (or renew your existing membership) and included with your purchase is a one-year subscription to Better Homes and Gardens! If you already have a subscription, this offer will extend it for another year. Want to support the Conservancy but don’t want to become a member?